Photo 8 is a professional event photography company specialises covering all types of occasions. We capture the high fashion and glam of your event. Our professional event photographer will bring special techniques and studio lighting to your venue. We offer instant printing on site, green screen studio. At Photo8, we pride ourselves at showing people at their best. For Your School Prom, Charity Ball or Corporate photography, we will provide an event photographer with a professional studio to capture the attendees looking relaxed yet stunning in their attire. Take advantage of our all-inclusive price to save on printing costs and guarantee everyone gets a picture to remember. Throughout the night, we will provide a friendly service for people to have their portraits captured and either printed on-site. Photo8 can offer a double studio if your event is larger in size to make sure everyone is catered for and has pictures to remember the night. If you are organizing a Charity Ball, feel free to contact us for our offers to maximize your fundraising! We are using the latest photographic and wireless equipment and have the facility to print on site and to create an individual password-protected online gallery for your guests. For more information about our photography service send us an email. 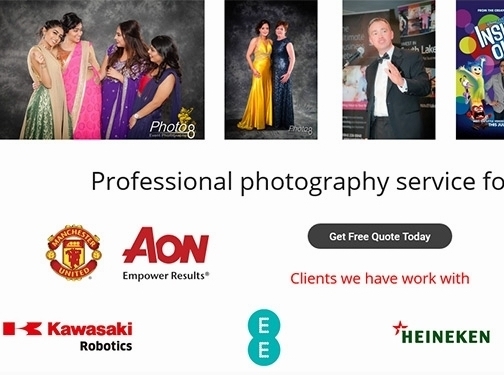 UK based business providing a range of photography services. Website includes details of services provided, work examples, client list, geographical areas covered, contact form.